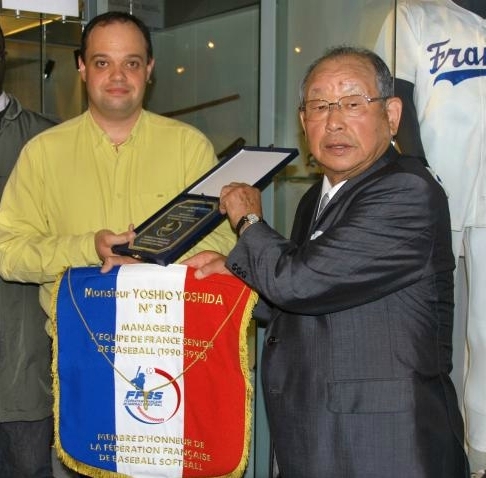 Paris, France - The French Federation of Baseball, Softball and Cricket (FFBSC), the governing body for Baseball in France honored Japanese baseball legend Yoshi Yoshida in a ceremony in Paris. Yoshida played professionally in the Japanese Major Leagues (NPB) as well as managing the Osaka Tigers. The honor in France was the result of Yoshida's connection to the FFBSC as manager of the French National Team from 1990 to 1995, which included 4th place finishes in 1991 and 1993 under his direction. The ceremony was held at the Paris National Sports Museum, and also saw Yoshida become an honorary member of the Federation.